2011 is the year of social media integration. Social media reached a tipping point in 2010 across a variety of metrics, most notably Facebook passed Google as the Web’s most visited site, based on Experian Hitwise research, and U.S. Internet users spend roughly one out four online minutes on social networking sites and blogs according to The Nielsen Company research. This growth was aided by increased usage of internet-connected devices, such as smart phones and iPads, that enabled owners to communicate on the go with family, friends and colleagues via social media networks. Concurrently, companies have expanded their social media presence to track what’s being said about their organizations, products and brands; to engage with customers, prospects and the public, and to promote their marketing messages. During these early phases of social media usage, firms utilize existing resources: internal marketing headcount combined with advertising agencies, PR firms and consultants. Measure return on investment (ROI). Develop and execute integrated social media strategy. Have corporate social media guidelines. Gain senior management support for social media. Dedicate at least one employee to social-media activities full-time. Closer examination of multinational companies’ 2011 social media business plans by The Altimeter Group reveals that social media is NOT just marketing anymore! The top three social media programs are brand monitoring, staffing and training. Companies need brand monitoring to protect their brands as corporate assets, regardless of whether they add social media marketing to their mix. This function requires heavy-duty data mining and may be done by marketing, market research, data analysis or an outside vendor or consultant. The challenge is having good, timely information. Social media requires additional headcount because it isn’t a one-way broadcast media. Social media requires both listening and engagement on relevant social media platforms. This translates to additional headcount, especially since participants expect to engage with company representatives. While firms can outsource this function, it’s best to use employees such as the marketing department or customer service representatives who understand your consumers. As use of social media expands, so does a company’s need to increase headcount to support it. Social media training is key because it’s changing how companies communicate with their customers across channels. As a result, organizations need to adapt their processes to ensure seamless integration across platforms. In my experience as a corporate trainer, firms expand training, which is an expense, to implement major cross-organizational changes because it’s less expensive. 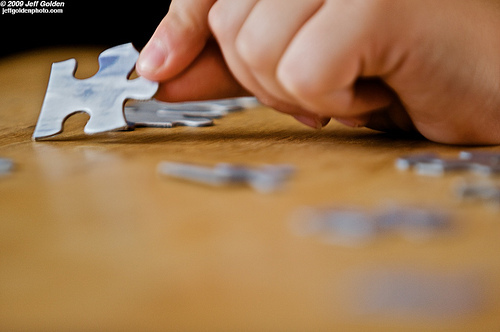 More importantly, it helps to break down the silos keeping employees from working together. During the training they build relationships across the company that facilitates this process. 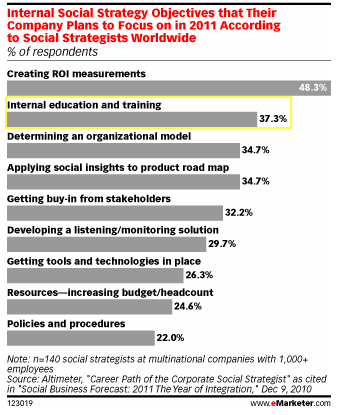 In terms of internal objectives, training ranks second to creating social media ROI metrics. This is attributable to the fact that these measures are needed to justify the increased corporate investment. That said, training is an element of social media expense that will be incorporated into the tracking. While 2010 laid the groundwork for expanded use of social media across the enterprise, 2011 will be the year in which social media gets integration across the organization. Social media will no longer be just about marketing and/or customer service. It will be incorporated into a firm’s processes to ensure an integrated customer approach. Do you see social media expanding beyond the marketing department? Where do you see the growth and why? How do you envision companies changing as a result of integrating social media? Tags 2011, Marketing, Social media integration, social media ROI, training. Bookmark the permalink. Thanks for the research Heidi. It’s going to be an interesting year for social media, isn’t it. It seems that businesses have turned the corner from using ROI as an excuse not to get into social media to a point where they’re scrambling to find ROI metrics to justify getting into social media. Are you seeing it that way too? Don’t get me wrong, we need real, measurable, and relevant ROI metrics. It’s just that I’m detecting a huge swing in the motivation for developing them.